I found an old Polaroid photo in my late uncle's collection. He worked at the grain elevator where the derailment happened. I posted a newspaper article about this derailment here. 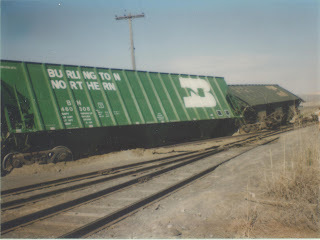 What I found notable about the whole derailment was it was the first time I ever got to see track workers in Coulee City. My favorite place to play near the tracks turned out to be the earthen ramp that led up to the old coaling dock for steam locomotives. There was a track at ground level next to the ramp that these track workers lifted for the rail to replace the broken rail at the derailment. The only time I had seen this rail used for anything was for loading hay into a boxcar once.